John Anderson founded Isagenix together with Jim and Kathy Coover in 2002. They started with a vision to create and impact on world health and to free people from physical and financial suffering. And indeed, they fulfilled that vision. Isagenix promotes healthy weight loss solutions through their 30 Day or 9 Day Program. Products include healthy snack packs, nutritional supplements, weight loss products, and skin care products sold through network marketing. 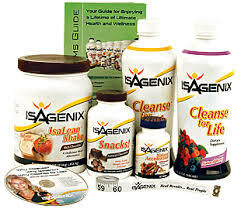 Isagenix offers you solutions for weight loss, energy, performance, aging, skincare and more. According to Wikipedia, Isagenix International – a multilevel marketing company is based in Arizona, USA with a Canadian distribution office located in Alberta and Ontario. With Isagenix, start-up is only $150. With this you can be your own boss and create unlimited income for you and your family. Isagenix offers six ways for you to earn: Retail Profits on Sale of Products, Product Introduction Bonuses, Team Bonuses, Executive Matching Team Bonuses, Incentives and Promotions. With Isagenix, financial rewards are endless.